An analysis of the individuals making up the lost generation of WWI. They involve a range of backgrounds and experiences, all states and classes, and come from a variety of military units – not just the infantry. 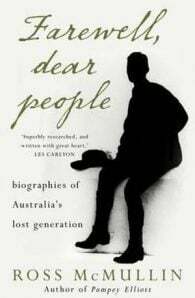 Ross McMullin is a historian and biographer whose main interests are Australian history, politics, and sport. He has researched and written extensively about the impact on Australia of its involvement in World War I. Dr McMullin's books include his biographies, the award-winning Pompey Elliott and Will Dyson: Australia’s radical genius; his ALP history, The Light on the Hill; and another political history, So Monstrous a Travesty: Chris Watson and the world’s first national labour government.